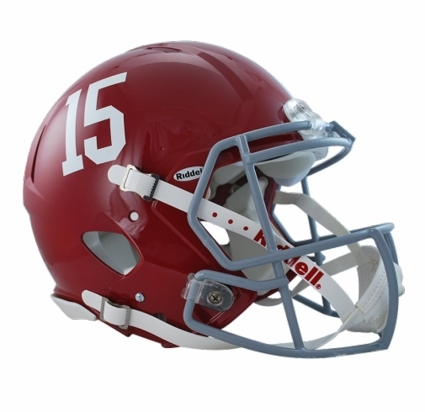 The Alabama Crimson Tide "15" Riddell Revolution Speed Authentic Helmet is just like the college players wear! This is an officially licensed Riddell helmet that measures authentic size and weight with a complete interior pad set. The Alabama Crimson Tide "15" Riddell Revolution Speed Authentic Helmet has taken the football world by storm - and now, the speed helmet is available as a licensed authentic helmet. With a distinctive, aggressive shell design, the speed helmet is being adopted by premier athletes at a furious pace. As a collectible, the NCAA Speed Pro Line will only be available for limited college teams. The Speed Pro Line helmet uses the special order face-mask worn by most of the star players who choose to wear this helmet. Internal padding is reflective of the "Speed Classic" design. A four-point chinstrap comes standard. Speed Pro Line helmets come in a Revolution retail box, with the addition of a "SPEED" sticker to distinguish it from our Revolution Pro Line helmets. Revolution Speed Pro Line helmets are the hottest new product worn by your favorite NCAA college teams. Perfect for autographs and looks great on the shelf, order your Alabama Crimson Tide "15" Riddell Revolution Speed Authentic Helmet today!